I'd like to start looking at buying transformers for the pair of cases I have built. Looking to do modern equivalents instead of trying to search for used originals. Can you provide the model numbers for the Sowter units that you used on your build? Any word about the custom capacitors for this project? For people in the US...Matt Can do the Power Transformers. But Not until June 1st. He can do the correct 650V CT. I measured to my original UA 175b..And the height is just 1/4" shorter. All other dimensions are spot on size wise. Having people send payment through 'Friends & Family' would be the way to do it without fees - buyers don't get any protection from eBay if anyone goes wrong in the process though. Earlier in the thread it was mentioned to use a 1285e, I don't see the 'e' version on the website. There's also 3 styles: Open Frame, Fully Shrouded, & Mumetal Can w/ threaded grommet - which one do we want for this build? Are there any other sowter parts to put in with this order? I'm already using a UTC A-18 and 0-1. I answered your mail yesterday Bram. But in case anybody else is wondering - the „e“ version is the one with mumetal can and threaded grommet. If you’re already using the UTC input and interstage, no other parts needed from Sowter. Ah, yep - looks like your email made its way into Spam. - The black front panels are going to the silk screener's tomorrow. - Turret boards production is being prepared. Regarding the can caps: Jonathan's (Quayhog's) initiative was to find a way to have access to the can caps we need to complete this build - since CE manufacturing ceased the production of their 2x20uf and 2x10uf can caps. AS far as I understand there won't be a group buy for the caps. At least not yet. And as far as I'm concerned I think I can't take care of that as well for now. If I understood correctly the price is already slightly lower compared to the CEs even if ordered individually. But if we could organize a group buy the discount would be around 17% off which would be cool too. Anybody volunteering to organize a group buy? anybody here has access to a RETRO 176? The color code points towards a 20K resistor. The question is what value is the pot? Where do the wires go on the pcb? 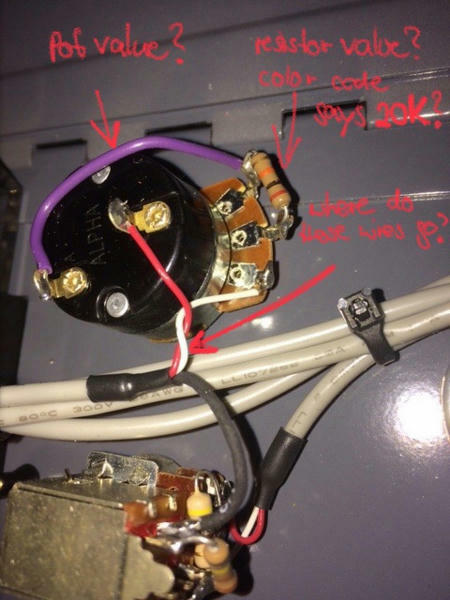 What are the next connections from where it's connected to the pcb/what are the surrounding components? here's my first version of the 176 BOM. Thanks Rainton, taking a look now... What resistor wattage are we looking for for the ones which are not currently marked? Great news, moltenwok - thank you for spearheading that for us. All resistors are specified 1/2W as per the schematics - but there actually are some 1W resistors used in the vintage units. I'll check which ones and add it to the BOM. But in terms of what's necessary 1/2W is fine.